Wire makes better jewelry than yarn does. There was a discussion on Ravelry about knitting with wire. I have never really understood why people would knit with wire. Clearly that is an application for crochet. Casting on and binding off are a pain to do with wire. I have been told that Continental knitting style helps, but I am still a “thrower”. When I started, I made a bracelet out of the innards of a phone cable and some cheap craft store beads. Then I did it again. Then I was out of wire and I bought some at the craft store. Pseudo jewelry wire is pathetic compared to phone cable with its gazillion microwires inside a casing, because the jewelry wire breaks if its bendy enough to be crocheted. If it is not bendy enough, then the whole thing is too frustratring to try. 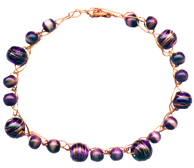 This is the bracelet I made for myself from copper wire and purple glass beads. The picture is from a long time ago, before I had a camera. I put it on the scanner. I do not wear it much anymore because the wire stretched and got fragile.